Ales Herasimenka, the spokesperson of the Business Union of Entrepreneurs and Employers named after Prof. M.S.Kouniavski (BUEE) and deputy editor of the weekly magazine “Belarusians and Market” was interviewed by BelSat on November 13th 2018. 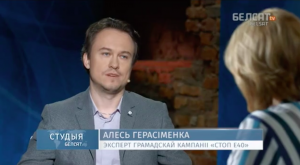 The subject of the interview was the E40 inland waterway, which Mr. Herasimenka considers to be an attempt to sink millions of dollars and an ecological catastrophe for the country. “Pripyat is one of the few rivers in Europe, which has been preserved to our time in a natural state.” said Mr. Herasimenka. “The construction of the required standard of class IV navigation route of course requires serious intervention in the river. There will be work for the dredging and straightening of the riverbed, and the construction of a cascade of dams. Once this happens, the river ceases to be a river, and turns into a channel, a wide ditch, a cascade of reservoirs with catastrophic impact on natural values” he added. BUEE has already made an analysis of the economic soundness of the E40 inland waterway and found that its implementation does not bring the promised economic benefits to the Belarusian society. The full interview is available here in Belarusian.